The police collect Senator Antonio Trillanes IV from the Senate and he has gone through the booking procedure already. This is after the Makati City Regional Trial Court Branch orders his arrest for the 2007 Manila Peninsula siege. Trillanes is facing a case for rebellion before Branch 150 Judge Elmo Alameda. The RTC allows a temporary freedom for the Senator after paying the Php 200,000 bail. However, if the warrant for the Coup d’Etat from branch 148 comes out for the Oakwood mutiny, it is not anymore bailable under the court-martial. The former President Benigno Aquino III granted him amnesty without the proper documentation. [VIDEO]: Atty. 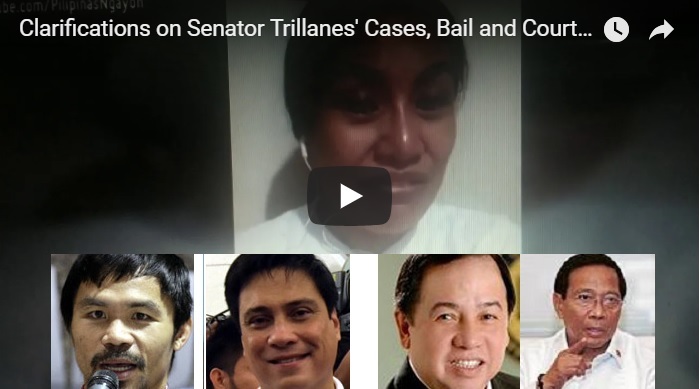 Trixie Cruz Angeles’legal insights on Senator Trillanes’ detention possibilities. A Makati court recently orders the arrest of Senator Antonio Trillanes IV. This is weeks after President Rodrigo Du30 voided his amnesty for his non-compliance to his amnesty’s conditions. It revives charges against him for the unsuccessful uprisings in 2003 and 2007. The Makati Regional Trial Court (RTC) Branch 150, handles the rebellion case against Trillanes over the 2007 Manila Peninsula siege. Whereas, the branch 148 has the jurisdiction over Trillanes on the non-bailable Coup d’Etat case. It issued the arrest warrant 21 days after the issuance of the President’s Proclamation 572 that made the Navy officer’s 2011 amnesty void. The court, in a 2-page order by Judge Elmo Alameda, also bans the Senator from leaving the country without its permission. It sets bail at P200,000 for Trillanes’ temporary liberty. Police officers and court sheriff, Bong Carreon delivers the resolution to the Senate, where Trillanes seeks refuge since September 4. At the time of writing, the noisy lawmaker has paid his bail and now back at the Senate. Early this month, the President issued Proclamation 572 that revokes the amnesty given to Trillanes for being void ab initio or void from the beginning. Proclamation 572 says Trillanes failed to submit an application form. Meaning, he did not admit his guilt in the crimes covered by the amnesty which is a requirement of the Presidential provision. With the amnesty revocation, the Department of Justice (DOJ) filed an ex-parte motion seeking a warrant of arrest and a hold departure order against Trillanes. The DOJ also asked the court to resume the trial with the prosecution presenting its evidence. It said that with the amnesty declared as void from the beginning, the dismissal of the case is also void. Therefore, the presumptive Vice President Leni Robredo is wrong when she said that the cases against him were already dismissed. This is because they can be reactivated once the amnesty is deemed unexistent. Presidential Spokesperson Atty. Harry Roque stated that: “The court has spoken. As the President has said, we will respect the decision of the judiciary.” It is but natural for the opposition to use this incident for the benefit of their intentions. They again stressed that the administration’s actions are undemocratic. Contradictory to that, most Filipinos feel that democracy is actually restored. The lengthy process of his possible detention clearly follows the rule of law. Former Vice President Jojo Binay, Former Davao Vice Mayor Paolo Du30, Senators Richard Gordon, Manny Pacquiao, Migz Zubiri, and many other pro-administration stalwarts now start to see the fall of the most irritating detractor. Government Presidential Spokesperson, Atty. 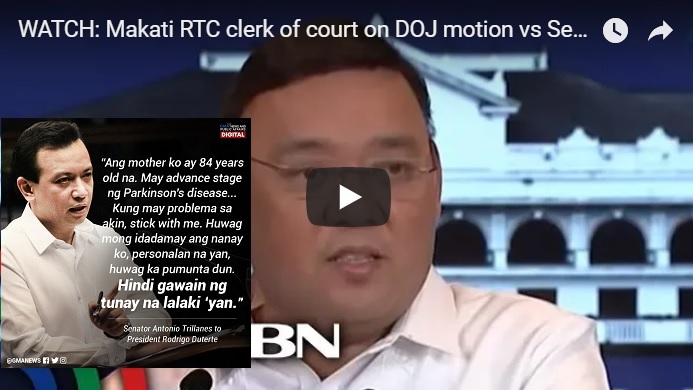 Harry Roque urges Senator Antonio Ttillanes IV to stop talking nonsense. He must deal with the facts by submitting his duly approved Amnesty application. Aside from that, the law as conferred with international standard states that only a President can grant and sign an amnesty. Contrary to wrong media impressions, it is not the former President Benigno Simeon Aquino III who signed Trillanes’ amnesty grant but the former Secretary of National Defense, Voltaire Gazmin. Roque insists that instead of catering to Trillanes’ gossips, Filipinos better prepare for the upcoming typhoon. The president cannot delegate the power to grant amnesty to anyone according to Du30. He is insisting that PNoy himself should have signed the document. However, Trillanes’ certificate of amnesty was signed by former defense secretary Voltaire Gazmin. This renders it void according to the President. Furthermore, this also makes other certificates of amnesty questionable, if Gazmin is the only signatory. 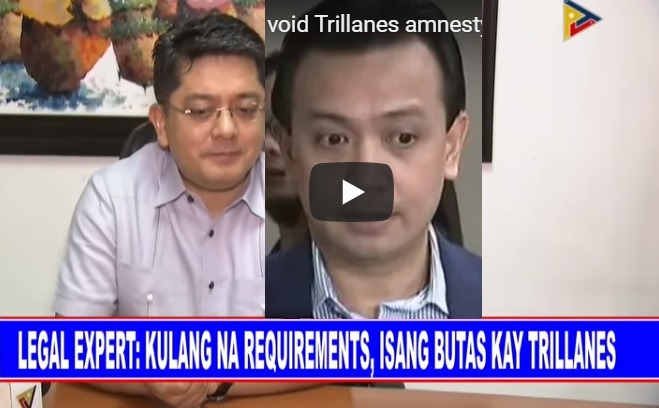 Trillanes argues that it is absurd to think of the President to have to sign probably thousands of certificates of amnesty. Consequently, he believes that the president can delegate such administrative tasks to a secretary serving as the alter ego. Solicitor General Jose Calida and Senator Trillanes were already not on good terms. Furthermore, Trillanes investigated government contracts entered into Calida’s family business to the ire of the Solicitor General. Calida personally called Defense Secretary Lorenzana for the documents relating to Trillanes’ amnesty. However, Malacañang is insisting that Du30’s proclamation was not colored by politics. Roque is saying that for Trillanes to prove the validity of his amnesty application, he should provide a copy of the acknowledgment of his amnesty application form. If the Department of National Defense could not find a copy, Trillanes will have to prove that a form was submitted to be able to dispute such a claim instead of the staging a word war with the President. Vice Presidential Protestant Bongbong Marcos’ lawyer agrees with Chief Presidential Legal Counsel Salvador Panelo that President Rodrigo Du30’s decision to declare void ab initio (void from the beginning) the amnesty granted to Senator Antonio Trillanes IV is constitutional. He should surrender himself to authorities because an amnesty is a conditional pardon. He must stay loyal to the current government and not to the previous one. All he has to do is present the proof of acceptance for his application which he failed to do so. He can stay in jail while fighting for his case. The same with the former senators Jinggoy Estrada and Bong Revilla. His can is somewhat similar to the quo warranto petition of the former Supreme Court Chief Justice Maria Lourdes Sereno when after investigation, her SALN was incomplete. Panelo is coming to the defense of President Du30’s decision of declaring void ab initio, Trillanes’ amnesty. He is arguing that the President’s decision is constitutionally allowed. Furthermore, Panelo is saying that Trillanes is abusing the grant of amnesty by not complying with the terms and conditions. With the signing of Proclamation No. 572 by President Du30, the amnesty granted to Trillanes is declared void ab initio. This is due to Trillanes failing to submit his original amnesty application to the Department of National Defense. This was for the crimes he has done in 2003’s Oakwood Mutiny and 2007’s Manila Peninsula Siege. Panelo is saying that Trillanes is essentially committing the same crime again. He is bombarding President Du30 with accusations that he has no proof of. Now, that he is called to answer his own crimes, he’s taking refuge at the Senate. 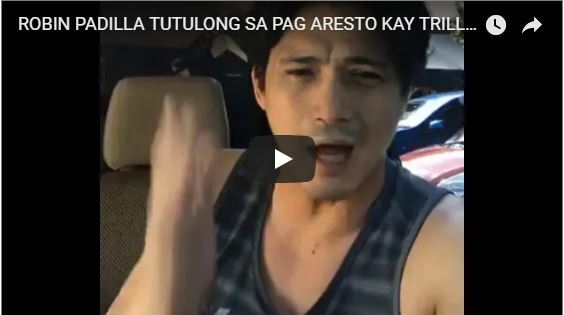 Actor, Robin Padilla cannot understand why ordinary people have to comply to authorities at once upon the invitation for questioning for a certain case. While lawmakers like Senator Antonio Trillanes IV are also lawbreakers. The so-called showbiz bad boy was outside of the Senate building, where the lawmaker has been staying in protest of President Rodrigo Du30’s order voiding his amnesty and directing his arrest. As Senator Trillanes’ classmate, Padilla is willing to lend his balls to Trillanes if he does not have it necessary to face the court-martial against him as a military man. [VIDEO]: ROBIN PADILLA TUTULONG SA PAG ARESTO KAY TRILLANES NAG-AABANG SA LABAS NG SENADO. Padilla is calling to Senator Trillanes to face the military court. He has been camping at the Senate grounds since the 4th of September. Despite his work, Padilla keeps doing this just to see Trillanes be brave and face the case against him. With Du30 declaring Trillanes’ amnesty void ab initio, he orders him to be apprehended. This is for the uprisings he led in 2003 and in 2007 against the government. Trillanes remains defiant, however. He asserts that with his amnesty the criminal cases he faced was already dismissed. Furthermore, as he is already a civilian he could no longer be placed under court-martial. Arsenio Andolong, however, explains that with Du30 voiding his amnesty, he has been reverted as a Navy lieutenant. This is because he still hasn’t produced the copy of the original amnesty application. Andolong is saying that it seems that only Trillanes has the copy of the original amnesty application. There were forms that were signed but they cannot locate the original application. They also don’t know if Trillanes physically submitted the application to Malacañang or the temporary committee. Although the troubled Senator showed his alleged amnesty application, he also failed to show any acknowledgment that it was received by the concerned agency. Defense officials are saying that Trillanes must be tried by court-martial while the search for the missing form continues. 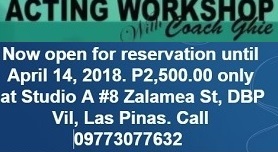 In the cases of Bong Revilla and Jinggoy Estrada, they were tried for plunder. This is despite either of them being from the military. While Revilla is still to be freed, Estrada is already free. Trillanes took an oath of allegiance to the Constitution on Jan 27, 2011. This is 94 other military men. The chief of the DND internal audit service, Patrick Rubin explains that the court-martial doesn’t lose jurisdiction over him despite being granted amnesty and separated from military service. Former Senator Bongbong Marcos recognizes the contribution of the Chinese-Filipino community in small and large scale businesses. He considers them as the drivers of the Philippine economy. 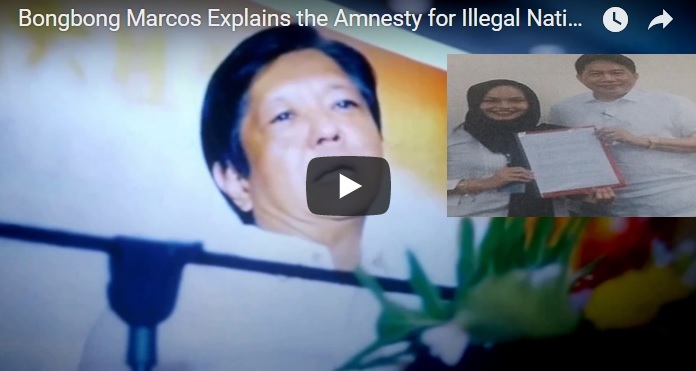 Marcos reminds Filipinos that 40 years ago, his father already sees the potential of this sector of society in many areas thus the reason for his Amnesty for Illegal Aliens to be Filipino Citizens. Sure enough. While the anti-government politicians continue to politicize the South China Sea dispute, Chinese-Filipino gas and oil explorers are now ready to extract Deuterium deposits from the Cotabato and Sulu basins. The members of the consortium are all Filipinos with global ties. It only awaits the Extraction Permit from the Evaluation Section of the Department of Energy. This is a wake-up call for Filipinos to be aware that the vast resources of these hydrogen fuels are in the country. On his speech, Bongbong Marcos discusses the importance of the Chinese- Filipinos not only in our economy but also in our history, our culture and all the parts of our everyday life. He recognizes his father’s wisdom when he declared amnesty 40 years ago as we can see now that the Chinese community has been an integral part of the Philippines today. Currently, Republic Act 7919 seeks to grant legal status to foreign nationals and their dependents illegally staying. They are the ones who have entered the country prior to June 30, 1992. They are given a resident certification of their registration as an alien living in the Philippines. Foreign nationals with permanent resident statuses are allowed to stay indefinitely in the country and enjoy the privileges of any Filipino citizen. That includes securing employment. Permanent residents, however, are not allowed to vote and own land. The late President introduced a number of significant bills when he was a Senator. Many of these bills found their way into the Republic statute books. His amnesty for illegal national paves the way for many Chinese residents to become full-pledged Filipinos. In the Filipino-Chinese consortium’s letter to President Rodrigo Du30, they seek the leader’s approval and endorsement. This is to pursue the oil and gas exploration and development of Cotabato and Sulu Basins. This is for the build, operate, and transfer which commences initially for operational, financing and purchasing of drilling equipment, operational budget, construction of refinery pipelines, and infrastructure for the two service contracts both offshore and onshore. The offshore acquisition package costs 10 million USD and 500 million budget cost. The onshore acquisition package costs 12 million USD and 700 million budget allocation for drilling contractors for the said oil and gas exploration. Plus directly hiring highly qualified manpower to operate and manage the corporation in order to ensure a very efficient operation to achieve higher gains and early return of investments. The group vows to cater to local consumption initially for Filipinos to benefit from its low prices. Truly, the Chinese-Filipino consortium members are the drivers of Deuterium extraction. NOT China indeed.